We'll get to the pictures in a moment, but first I would like to tell you about our day. The station called us with this story in Mentone. Seems a kid from Mississippi had died from rabies after being bitten by a bat while at camp in Mentone. Head up there, they say, and plan on being live at 5 and 6pm. So off we go on the hour's drive up to Lookout Mountain. We get to the camp and they release a statement saying the Center for Disease Control in Atlanta had determined that the boy had not been bitten by a bat while at their camp. Seems a bat had flown in kid's room and he took it out, and that's where he contracted rabies. So the story is a bust and back to Albertville. But near the camp is Howard's Chapel. 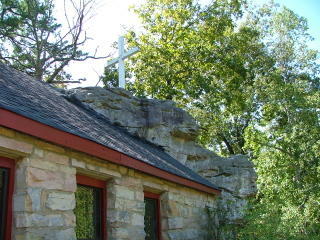 The church was built in 1937 by Colonel Milford Howard and was built around this huge rock. 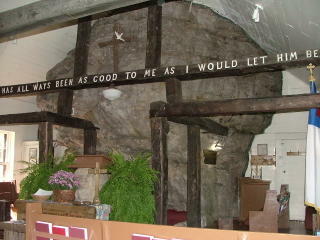 As you can see, the rock comes into the pulpit area and takes up a good bit of space. The good Colonel is even buried in the rock, as his ashes were put there after his death. The church is always open to visitors and is just one of those off the wall kind of places that I love to search out and find. Oh, if you would like call Mrs. Mary Shirey at 256-638-4441 to book your wedding at the Chapel.